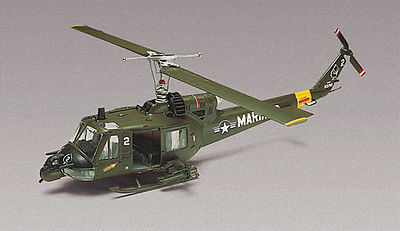 This is a 1/48 Huey Hog Helicopter Plastic Model Kit. This is a skill level 2 for intermediate modelers, ages 10 and up. Retail $15.95 SAVE 23% ! This is a good model for beginners. It is a simple and fun kit. The parts are dark olive drab and the kit contains 2 pilot figures. Part fit is not all that great and some of the pieces require sanding while some of the seams need some putty to fill-in the gaps. The biggest fit problems were with the clear pieces; you got to do a lot of dry fitting before gluing these pieces. On the bottom you will have several holes and gaps as there are no parts to cover them. The seats require some work as they lack detail; you got to add some cushions and other parts to make them look a little more realistic. I was happy with the decals, they went on perfectly with a little help from Micro Set and Micro Sol decal solution. All and all not a bad kit considering the price. Contains a total of 77 pieces. 40 mm grenade launcher mounted in the nose - very unique feature. Includes a pilot, twin machine guns, and two rocket pods. Can be assembled with the doors open or closed. Authentic U.S. Marines waterslide decals. Molded in olive drab and clear. much smaller warning and location decals. It has been quite a while since I built my Huey model, but I remember that it was not hard to build. To my memory, the directions only had seven steps. Overall it was another very good Revell model kit. For making a Vietnam War helicopter at a cheap price, this kit is the way to go. Note: the plastic is molded in a brown/olive color. "the hog is a pain"
Well this is an old kit and it shows. MY problems started with the fuselage halves they were very badly warped especially in the tail boom. I needed to use clothes pins to hold it together while the glue set. The instructions told me to put the pilots in the wrong seats 1 pilot has his hands on the stick the other is reaching for the control panel if you put them in wrong the pilot will try to reach out the closed door window. The other major hassle is the nose it is seperate from the fuselage and will not fit well without a lot of trying to make it fit. The interior of the copter doesn&apos;t set well either. All the exterior slots for the landing skids and the gun mounts are too large for the parts and will not look good afterward until filled with puddy. the weapons go on easy once the gun mounts are set in place. The 40mm on the nose will swivel up and down and goes on well. The other annoyance was the windows especially the cockpit roof ones don&apos;t fit well at all. In the end I did tame this beast but it required a lot of paint and puddy to cover all the defects. once done it does look good at a distance. The good: For its age, the molding and shape is generally good, and the details are adequately represented. With some work, a very nice model can be made, and aftermarket decals, photoetch and resin parts allow the modeler to make an accurate masterpiece. The bad: The kit is sold as a C model, but it&apos;s really sort of a B/C model, a result of Monogram selling it as an early B model Huey medevac in the early &apos;60s. As larger D models were developed in the mid &apos;60s, the B models were converted to gunships, but since they were underpowered for the armament that was attached, the C model was developed from it pending the arrival of the AH-1 HueyCobra, with a larger chord 540 rotor system, larger chord vertical fin and synchronized elevators and upgraded 1100 shp engine. In response to this evolution Monogram decided they wanted to model the C gunship, and they replaced the B model rotor, but did not change the vertical fin or sync elevators, leaving the model some B, some C. The ugly: Assembly of the unusual parts breakdown is a real challenge. There are two fuselage halves, but the roof of the cabin is a separate piece. Getting the fuselage together requires patience, but can be accomplished, and that is the biggest hurdle, and requires patience. Also, adding a little weight to the nose in the form of a couple of 1/4 oz fishing sinkers or split shot keeps the Huey level on its skids. IIRC that is not mentioned in the instructions. Overall, this kit takes patience, and some extra bucks to make it a really accurate model, but built out of the box with some patience gives the modeler a creditable nearly-Charlie model Huey, For an experienced modeler looking for a bit of a challenge, this can be a good choice. For a first kit, the modeler should look elsewhere. WARNING: Keep from small children. Contains small parts which may be swallowed. Revell-Monogram models have various skill levels, 1 being the easiest, 3 being the most challenging. Cut out bottom of box to display the finished model.